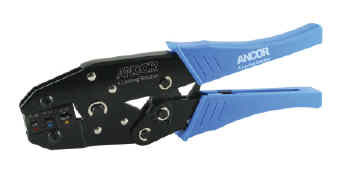 Full cycle crimps on ANCOR connectors, recommended for Heat Shrink Connectors. Jaws are hardened 4150 steel with hardened centerless ground pins adjustable for wear. Capacity: Crimps terminals and connectors from 22 - 10 AWG /0.3-5 mm2 in three color-coded cavities. "Solderless crimp on connectors shall be attached with the type of crimping tools designed for the connector used, and that will produce a connection meeting the requirements of E-11.16.3.3" 11.16.3.8.